Cuban Foreign Minister Bruno Rodríguez Parrilla declared there is “no evidence” that American diplomats have suffered acoustic attacks, leaving them with hearing loss and brain damage, at a press conference Tuesday responding to the expulsion of 15 Cuban diplomats from U.S. soil. The U.S. State Department confirmed, also on Tuesday, that they had requested the withdrawal of Cuban embassy staff in Havana, accusing the communist Castro regime of being either unwilling or unable to protect American diplomats as dictated by the 1961 Vienna Convention. American officials have confirmed 22 cases of illness or injury in U.S. diplomats and their families working at the embassy in Havana and have not blamed Cuba for the attacks in question. Nonetheless, a State Department official told reporters in a telephone briefing that the U.S. “could not come to any other conclusion” than that their diplomats were targeted and attacked. “Science fiction, futurism, what is this?” Rodríguez asked reporters Tuesday. “There does not exist evidence of the occurrence of the alleged incidents, or the causes and origin of the health symptoms American diplomats and families notified us of,” Rodríguez told reporters in an extensive press briefing, quoted in full by communist propaganda outlet Granma, which referred to the attacks on U.S. diplomats in scare quotes. “The government of the United States is responding in a precipitated, inappropriate, and irreflexive manner, without evidence regarding the occurrence of the deeds mentioned, in which Cuba has absolutely no responsibility and without having concluded the investigation currently underway,” the statement continued. 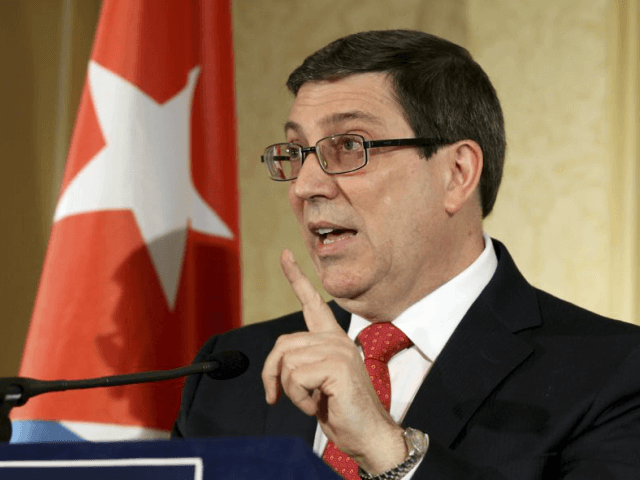 “The lack of seriousness in this [investigation] is surprising,” Rodríguez railed, adding that the Cuban government does not possess any technology which could cause the allegedly acoustic attacks in question. Former Cuban political prisoners have testified to being tortured by Cuban officials with sonic devices in prison, long before the State Department revealed such attacks were occurring. During the daily press briefing on Tuesday, State Department spokeswoman Heather Nauert confirmed once again the health symptoms of the diplomats in question, without elaborating on what those symptoms are, citing medical privacy. She noted that the total number of cases of such attacks now stands at 22. Reports from major news outlets described the symptoms as brain damage, hearing loss, migraines, and other “concussion-like” symptoms, and suggest that an acoustic weapon could have been used against the diplomats.